The Guitar Sanctuary of McKinney, Texas currently lists this NEW Trussart Steel-O-Matic. 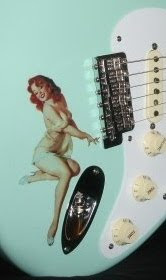 The Antique "Silver" (steel) Paisley top adorns an alder body finished in Seafoam. So, just know that Trussart guitars aren't all metal, ok. Sanctuary has plenty of other nice inventory too! A maple neck finished in grey complements the entire theme. Both the metal top and headstock face cap are recessed into the wood. Neck profile is what they call a '52, meaning it's chunky, but as to "V" or "D", you'll have to contact dealer. Radius is 10", with 6105's. Pickups are by Arcane. Includes COA and G&G deluxe hardshell case (per website, not indicated at eBay). I checked these out at NAMM. They're exquisitely detailed and not on the heavy side, as one might assume.